John Haloran (Peter Read) and his wife Louise (Luana Anders) are relaxing on the lake when they begin to argue about his eccentric wealthy mother’s will. Lady Haloran (Eithne Dunne) has arranged for her fortune to go to a charity under the mysterious name Kathleen. John reminds his wife that she won’t inherit anything if he dies before his mother, he then immediately has a fatal heart attack. Louise dumps John’s body in the lake and makes it look like John is away on a business trip so she can trick Lady Haloran into changing her will. Haloran Castle has a strange tradition where the Haloran family must relive the funeral of Kathleen every year, where Lady Haloran faints every single time. Louise then begins her cruel plan.You have to see Dementia 13 for yourself because the description of this film will never match the visual madness. Louise Haloran (Luana Anders, Easy Rider): John’s unhappily married wife. She married for money only to find out that he doesn’t have access to his share of the fortune. John Haloran (Peter Read, Freakshow): A workaholic that doesn’t think very much of his wife, or his mother’s tradition. Lady Haloran (Eithne Dunne): A superstitious, demanding woman. She holds onto the family fortune with a deathgrip, and loves to remind her children that they are powerless. Richard Haloran (William Campbell, Hush … Hush Sweet Charlotte): A temperamental artist that is tired of the family tradition. He is in a loving relationship with his fiancee, Kane. Billy Haloran (Bart Patton): He’s a friendly young man that cares for his mother. Kathleen Haloran (Barbara Dowling) : The youngest Haloran child that died in a tragic accident. Her presence is felt throughout the film. Kane (Mary Mitchell) : She’s an American girl raised on promises. She is a charming, cheerful girl in contrast with her fiance Richard. Dr. Justin Caleb (Patrick Magee, The Masque of the Red Death): The loyal family doctor that is protective of Lady Haloran. He has an excellent scientific mind, and would make a great detective. Dementia 13 was filmed at a real castle which really helps with the atmosphere. The castle is elegant, and inviting during the day, but eerie, and haunting in the dark. You can feel Kathleen’s presence throughout the castle and on the grounds. The cinematography for Dementia 13 is fantastic. The problem with the movie takes place at the halfway mark. 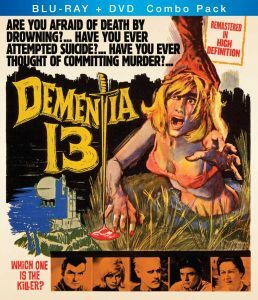 Dementia 13 destroys the wonderful atmosphere, and focuses on a slasher plot. It’s a great story that is buried under useless gore, and needlessly tacks on a plot about the hatchet killer’s motives. The actors, and actresses bring a lot of personality, and likability to their characters. Dementia 13 has a beautiful setting, interesting characters, a well written script, and a compelling story. Until they decide to turn the plot into a film about a lunatic with a hatchet.